Legenda, which is the publishing imprint of the Modern Humanities Research Association, is on something of a Sebald kick at the moment. Two years ago they issued the rather massive anthology Saturn’s Moons: W.G. Sebald – A Handbook (which I covered extensively over several posts) and they will publish Helen Finch’s book Sebald’s Bachelors: Queer Resistance and the Unconforming Life later this summer. But in the meantime, they have just released Dora Osborne’s Traces of Trauma in W.G. Sebald and Christoph Ransmayr. Why these two authors? Osborne explains that Sebald and Ransmayr are both representative of post-postwar literature, both share a skepticism towards the idea of human progress, and both “respond to the non-viability of conventional forms of narrative after 1945.” Sebald and Ransmayr are “caught between a contemporary espousal of postmodernist gestures and a nostalgic or melancholic attachment to modernist ones.” As the title of her book makes clear, Osborne sees trauma as a central way of defining the legacy of the Holocaust and she opts to use trauma theory (largely derived from Freud and Walter Benjamin) as the principal lens through which she will explore the works of Sebald and Ransmayr. Thus, in a nutshell, it is Osborne’s intention to examine works by these two authors to see how they deal with the traumas caused by the Second World War. 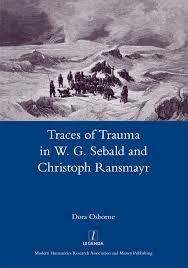 In order to focus more closely on the Sebald half of her book, I’m going to ignore the chapters dedicated to two books by Ransmayr: The Dog King and The Terrors of Ice and Darkness. I wrote about the latter book several years ago, although I can now see from Osborne’s book how much I missed the first time through. Osborne dedicates a chapter each to Sebald’s books The Emigrants and Austerlitz. In the four semi-biographical stories told in The Emigrants, the source of their trauma is no mystery, leaving Sebald to focus on the aftermath for each of the protagonists and on the Sebald-like narrator. In the chapter called “Displacement, Dysfunction, and Erasure in The Emigrants” she initially approaches the four stories through Freud’s case from 1909 known as “Little Hans,” which was well-known to Sebald and directly referenced by him in After Nature and elsewhere. Peculiar to this case were characteristic spatial anxieties (“the spaces of habitation and travel”) that are shared by all of the main individuals portrayed in The Emigrants. I will show how moments of breakdown or collapse in Sebald”s stories expose the experiences of loss that irreparably mark the lives of the emigrants and overwhelm the attempt to give belated expression to them in narrative. In other words, I will show how, in The Emigrants, Sebald moves between the two positions of his emigrant protagonists and his emigrant narrator, that is, between a tracing of the modern experience of displacement and dispossession and its retracing as part of a post-postwar narrative. Osborne argues that Sebald continually demonstrates that the narrator is only permitted to see traces of the traumas experienced by the others. Even the photographs embedded in the texts tend to obscure rather than enlighten the narrative. Thus, The Emigrants is about limits – the limits of the protagonists’ abilities to cope with their traumas and the limits of the narrator to effectively grasp the lives of others. The emigrants seek to escape the constraints of family, family history, and history writ large, but the systems via which they seek liberation are found to be overwhelming because they are implicated in the monstrous working of recent history. Sebald the post-postwar author is acutely aware of the sense of dislocation, even disintegration affecting the post-Holocaust subject, and viewed from this perspective, the lives he attempts to describe can only be represented in their drive to self-erasure. In my next post, I’ll say something about Osborne’s chapter on Austerlitz.